Hey guys, have you heard about the Whiff Of Joy Advent Calendar where everyday a card is posted on Katharina’s blog and you get the chance to win some yummy blog candy? I have a Whiff Of Joy make for you all and this one uses Sled Packed with Gifts, Freezing Willow and a sentiment from the Winter kit. I’ve coloured her with Copic markers and added some Stickles glitter bling. Right off to make more Christmas cards! I’ve recounted and I only have around 25 more to make and not 40 as I first thought – phew! 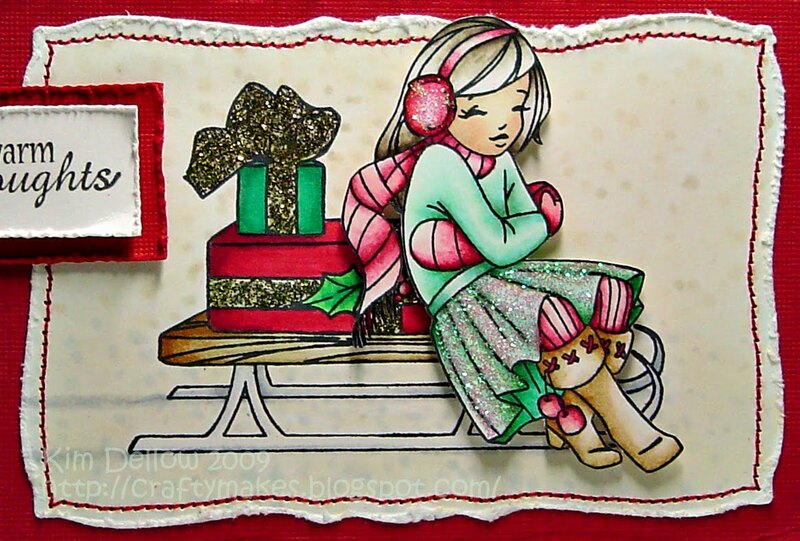 what a fun image…reminds me of me…I'm always freezing…always wear my coat at work….super darling card Kim!!! This is a beautiful card. I love the image and your colouring is gorgeous. It's really cute. Kim this is truly beautiful. So love the distressing and stitching and you have brought this image to life so perfectly with your colouring. Just love how you pieced all this together! Ooh, Kim! I'm liking this very much! Especially the distressing on the edges of the nesties labels.. Not seen that done before (on those).. they're usually so neat, but this looks fab! Mind if I borrow that technique occasionally? This is so pretty. The colors are fabulous. Great card. I love your colors. Your card is stunning! I love the way her skirt shimmers in two different colors! what a stunning card Kim! love the way you coloured up that fab image! Beautiful Kim, and very lovely! WOW Kim this is GORGEOUS!!!! LOVE all your deets and your coloring WOW GIRL!!!! HUGS! AMAZING work Kim! I love this! Gorgeous coloring hun! It's gorgeous Kim! The stickles are the perfect touch! What a precious card Kim! It's beautiful and I LOVE the winter fairy! You did an amazing job!